For you know that the trial of faith imparts to you patience. “It never ceases to amaze me how many people I see being pulled along by their dog while out “walking”. What amazes me more is that most of these people blame their dog for this behavior. If they only realized that the problem is on the other end of the leash. If your dog pulls on the leash, you’re kidding yourself if you think you’re the “master”. Dogs are smart, and they will take advantage of a situation if you allow them to. The worst part of this situation is that it only takes a short period of time to teach your dog to heel. Since walking with your dog is something that you should be doing every day, from the very beginning, it only makes sense that the “heel” command is among the first that your dog learns. Don’t leave. It’s not the wrong blog, and I haven’t lost my mind. It's been a while, but it's time for another sermon from the dog. We were walking this morning, and it all came together. So often we quote James 1:2, "Count it all joy, my brothers, when you meet trials of various kinds,” in times of hardship. I must admit I haven’t always given the same attention to James 1:3, “knowing that the testing of your faith produces endurance.” My dog knows this, but it’s something I’m just learning. As Christians, our lives might be easier if we could learn from this example and learn to walk in heel. Christianity teaches men to be joyful under troubles: such exercises are sent from God's love; and trials in the way of duty will brighten our graces now, and our crown at last. Let us take care, in times of trial, that patience, and not passion, is set to work in us: whatever is said or done, let patience have the saying and doing of it. When the work of patience is complete, it will furnish all that is necessary for our Christian race and warfare. We should not pray so much for the removal of affliction, as for wisdom to make a right use of it. It’s the same thing…me and the dog. Faith imparts patience. 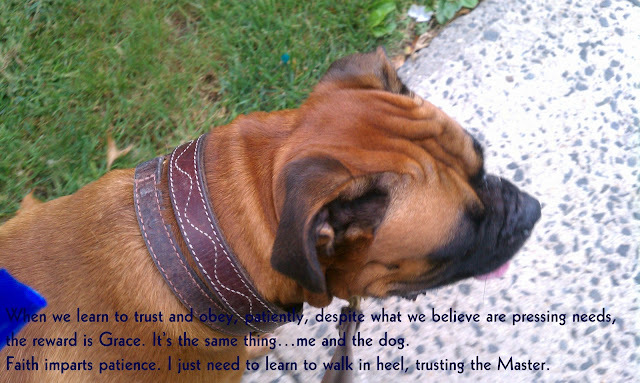 I just need to learn to walk in heel, trusting the Master. When we learn to trust and obey, patiently, despite what we believe are our pressing needs, the reward is Grace. We are rewarded with safety. We are reminded that God is good. On Sundays, I fellowship with the crew at Spiritual Sundays and Salina.